Everyday is like Sunday: What's in my current Make-Up bag? I find seeing what other people keep in there make up bag so I thought - why not? 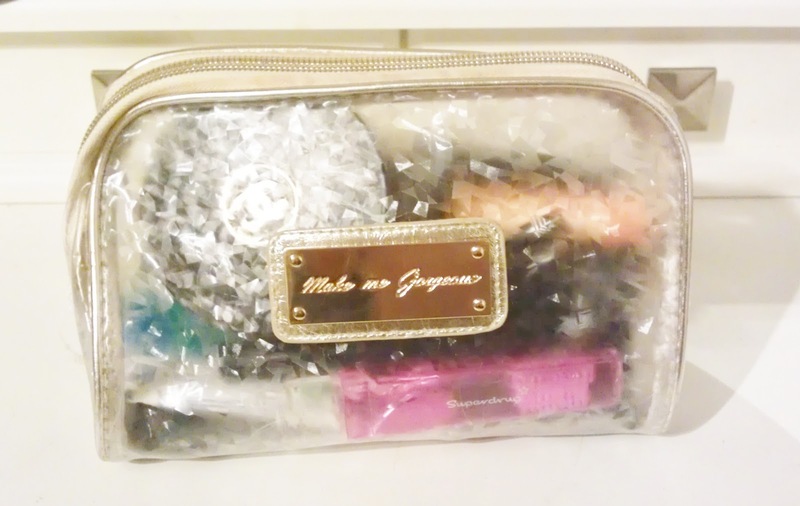 This is the make up bag I'm using currently. It is from Primark and cost only £3! I love Primark's cosmetic bags, I own about 6 or 7. I've numbered everything so I can go over it easier. I do change it about slightly everyday but there is a few products which are everyday favorites of mine. 1. Too Faced Candlelight Softly Illuminating Translucent Powder - I love this powder for a very gentle highlight during the day or lightly dusted all over the face at night for a glow. It has beautiful gold glitter/shimmers that look amazing with a bronzed face. 2. GlossyBox mirror - Just a mirror I got with the Birthday addition GlossyBox! 3. MAC Studio Finish Concealer w/SPF 35 - Only recently got this concealer as there isn't a MAC anywhere near my city and I really don't like ordering cosmetics online as I can't test them out etc. however this concealer is amazing! I've been loving it for under the eyes and over my lips before applying lipstick. Also covers the slight redness around my nose - love it! 4. Illamasqua Cream Blusher in 'Betray' - This is another internet buy and even though Illamasqua is my favorite brand just now it looked different on the website! However I love this blush all the same. The TINIEST bit is needed for a lovely flush and as it is fairly red toned I've been adding a little over the face for a ever so slightly sunburnt look (sounds daft but makes my tan look natural). 5. Chanel Soleil Tan De Chanel Bronze Universal - My favorite make up product EVER - hands down. My face doesn't hold fake tan no matter what I do, I've tried everything but I always end up with a white face. This matches my body and my face and looks wonderful! I put this on before my concealer because I feel there is certain areas this fixes itself, wonderful! 6. Revlon ColorStay Liquid Liner - This is a good liner however I'm on the hunt for a good liner brush so I can go back to my Clinique Gel Liner. That's my favorite! 7. Rimmel Eyebrow Pencil in 'Dark Brown' - I've switched to this from the Sleek Eyebrow Kit as for some reason I'm finding the Sleek kit to be to smudgy and messy on my eyebrows causing them to be odd. I don't know if it's the hot weather we are having or what but I'm glad I have this pencil, it's really good! The brush on the lid is amazing for brushing the product through. My eyebrows are looking lots better now that I've returned to this product! 8. HD Brows Brow Beater - This is just a clear eyebrow setting gel that came in my GlossyBox. Love it! Supposedly it conditions too! 9. Loreal Million Lashes Extra Black - I was using Diorshow Iconic but I HATE it. It's so messy for some reason? But this mascara is really nice, it gives volume and length. 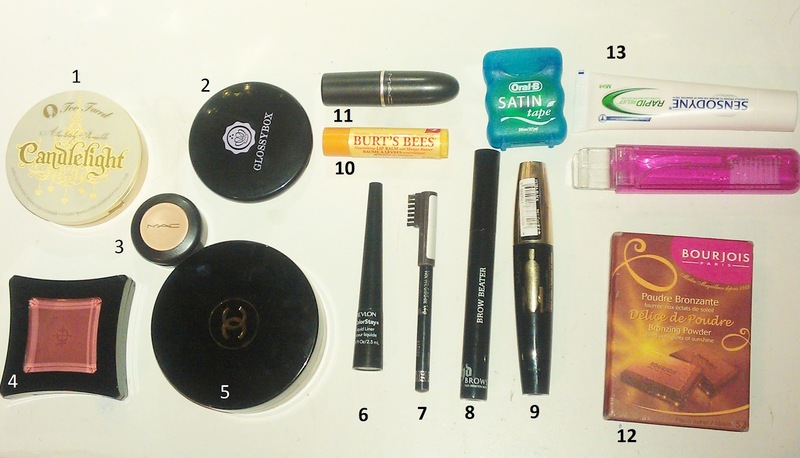 Something missing from my bag is my Elizabeth Arden Mascara Primer which I use everyday but don't carry around with me! 10. Burts Bees Mango Butter Lip Balm - I LOVE BURTS BEES. This is my newest addition and I think in the Lip Balm department it has replaced Burts Bees Pomegranate. I have crazy dry lips and this gets them super smooth ... so good! 11. MAC Lipstick in 'Amorous' - This is my favorite lipstick just now. I like darker lipsticks and this is a beautiful berry shade. I talked about is in the post below. 12. Bourjois Delice De Pourdre - Best bronzer ever! Smells amazing too! I dust this over my face with a huge powder brush to add warmth. 13. A Travel Toothbrush, Toothpaste and Dental Floss - Just in case!